Several weeks ago I packed up my little cicada car (PT Cruiser), put on my sunglasses, filled up my iPod, and drove 10 hours up to West Hartford, CT for my seventh long-distance mural. My client was my uncle Mike, who is a Doctor of Osteopathy. The waiting room in his office is decorated with lots of beautiful artwork from Ten Thousand Villages (where my aunt Donnie works), but still felt a little empty. 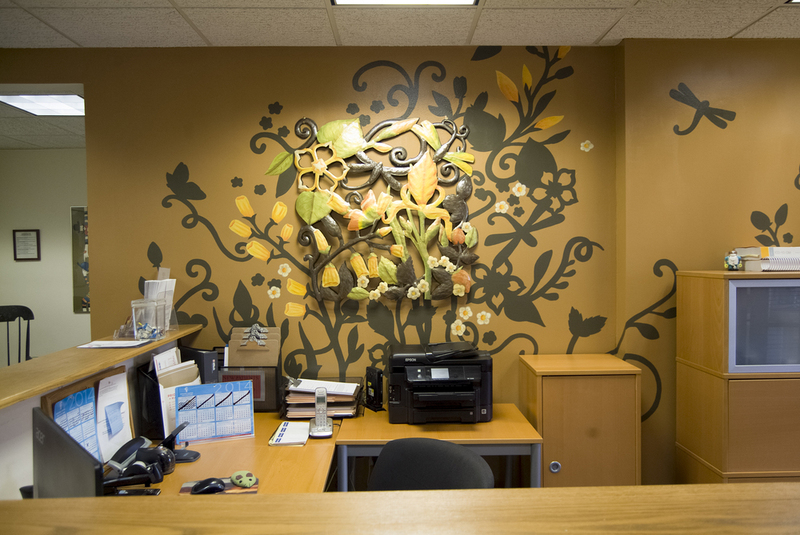 I designed a mural that would bring the existing artwork and the empty space together and to life. These before-and-after shots are of the plain office Mike and Donnie left behind on vacation, and the finished mural they came home to. Check out the PROJECT PAGE for a process .gif, more detail shots, a closeup of the original Ten Thousand Villages metalwork piece, and more!